From high street shop to a major online player. Award-winning streetwear company Urban Industry left it to us to implement a complete B2C sales platform which has allowed them to manage stock better (even over multiple channels), handle high volume orders and provide reliable shipping. We also optimised the website to work on smartphones and tablets. These functions, combined with our hands-on strategic ecommerce advice have fortified the business. Their products are selling faster than ever and customers are coming back again and again. Since Visitors are able to easily search and browse a wide range of products, without being obstructed along the sales path. The results have been phenomenal! We integrated Urban Industry’s website with PayPal and Checkout by Amazon, so customers could pay directly with their account. And by setting them up as a ‘premium seller’ on Amazon UK, with a customised storefront design, the company is reaching new customers every day. 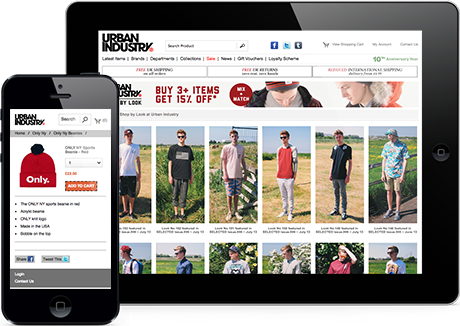 Urban Industry has not only seen increased conversions, but also a heightened awareness of their brand, boosted by joining up with the Rakuten Affiliate Network. Urban Industry manages stock control and order fulfilment easily with our robust ecommerce offering. And the order dispatch process, which includes integration with world-leading shipment company MetaPack, means customers globally receive their order on time and in the way that suits them best. Award-winning independent streetwear clothing store Urban Industry launched its ecommerce arm a year after it opened its shop in 2002. The company selects labels slightly off centre from the usual high street names. Today, still located in Eastbourne, Sussex, but with a global clientele thanks to the success of the website, Urban Industry carries over 2500 different products from over 100 worldwide clothing brands.